You may have heard the south referred to as the cradle of American racism and wondered if it were true? Recent events out of Georgia are proving just how racist it has become. In December of 2008 racism was nearly a dead issue, but since January 20, 2009 all we seem to hear about is racism. If you wanted a record of Obama’s birth certificate, you were a racist. If you didn’t like Obamacare, you were a racist. If you stood against any of Obama’s anti-American policies, you were a racist. If you were upset finding out that Barrack was gay and married to a transgender, you were a homophobic racist. Maybe it’s just a case of America getting what it deserves for putting a non-natural born gay jihadist into office, but every since he became president, whacked-out liberals have been trying to push whites to the back of the bus. Situations in America have taken a turn for the worst. No matter how much you believe president Trump is going to save this country, the dangerous issue of racism is showing no signs of withering. While Roseanne Barr gets fired for a harmless joke, Jussie Smollett gets let off and praised for trying to start a race war with lies. If Roseanne was a black liberal, she would have been given a raise and her show moved to number one. Had Jussie been white, he would be sitting in jail right now. That’s racism alright. From all black colleges to all black television channels, left unchecked it has brought us to the current trend of “no whites allowed”. Just take a look at recent comments by comedian/director Jordan Peele, who says he would not give a lead roll to a white man. It’s a formula he’s not interested in messing with. That statement sounds a lot like racism, does it not? If this was said by a white director, it would certainly be the death of their career. If that isn’t enough to prove how strong racism has become against whites, a recent event in Georgia certainly is. On Wednesday March 27, a meeting in Savannah for the upcoming mayoral race was held. 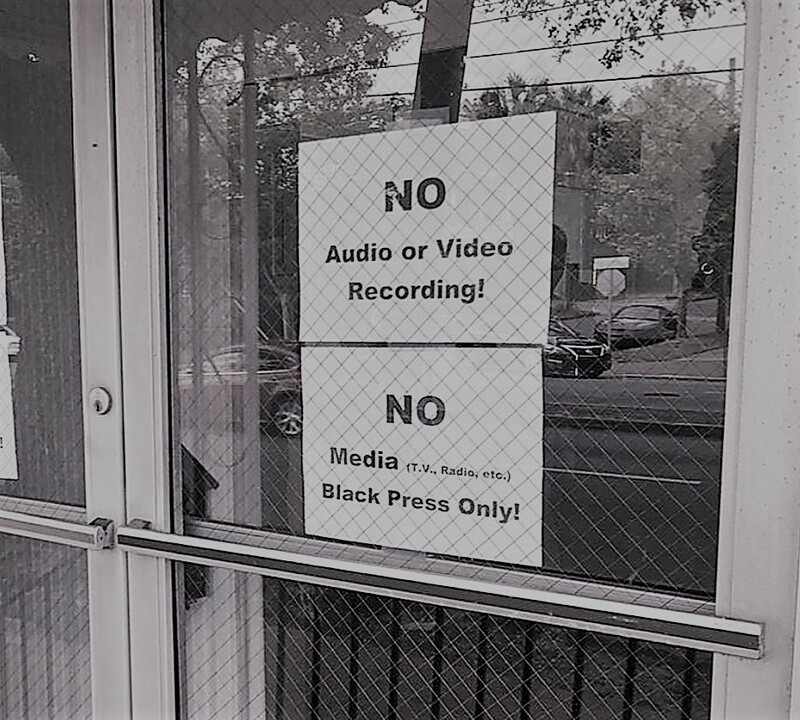 Organizers had barred all non black reporters from admittance, posting a sign at the entrance that reads “Black Press Only”. Organizers of a meeting to discuss an upcoming mayoral race in Georgia barred reporters from attending — unless they were African-American. Yes, this is happening right now in the United States! If America is to survive and be a great nation, something has got to give. Either the President needs to declare racism defeated, or a white man needs to have a dream and organize a peaceful march. If this new trend of hating the white race is not stopped soon, we could see “the purge” become reality by next year. The issue of race is being fueled on purpose, it’s about division. The powers that hide need to keep us divided. Black against white, left against right, they need you distracted. As long as we are fighting each other, we are not fighting them. Contributed by L. Steele of AmericaUncensored.net, where this article was originally published. Permission granted to republish in digital form for noncommercial / non-paywall use, provided full author credit and a direct link to this page.